UNKNOWN SOLDIER (Tuntematon sotilas, 2017), a 2nd World War Drama directed by Aku Louhimies, has reached 1 011 800 spectators, which is an all time record for a Finnish movie since the launch of contemporary statistics in the early 70’s. UNKNOWN SOLDIER comes second only after James Cameron’s TITANIC (1997) with 1040 780 spectators, leaving behind all Star Wars and Bond movies. 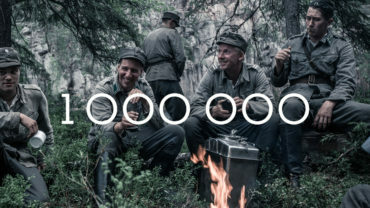 The biggest production in the history of Finnish film, UNKNOWN SOLDIER has brought together generations from the young to the approximately 15 000 WW2 veterans still living in Finland. Many say the movie has evoked a new understanding about the horrors of war and an increased respect for those who fought in it. Young moviegoers also say the grippingly depicted personal experience of the young men and women on the front, as well as those left to maintain the homefront, they feel they understand the realities of those forced to flee their homes in crisis areas. “Since its founding in 2000, SF Studios has been distributing films of contemporary masters including Tim Burton, James Cameron, Clint Eastwood, Sofia Coppola, Peter Jackson, Terrence Malick, Christopher Nolan, Ridley Scott and Steven Spielberg. While UNKNOWN SOLDIER has gone to the top of all contemporary viewer statistics, we’re proud to add Aku Louhimies’ name to the list of these great directors. We congratulate Aku Louhimies on the achievement and wish UNKNOWN SOLDIER all the success it deserves in the global market.” says Timo Räisänen, CEO of SF Studios, distributor for UNKNOWN SOLDIER in Finland and the Nordics. The film was released on October 27, 2017. The war drama, set during the Continuation War (1941¬–1944), is based on a 1954 novel by Väinö Linna. The distribution of the film in Finland has been exceptionally wide. It has been screened at nearly all of the Finnish cinemas, and there have been special screenings for veterans and students, and at hospitals, retirement homes and prisons.